Attendees are seen during the World Economic Forum annual meeting in Davos, Switzerland, Jan. 24, 2018.
taking advantage of Tehran's conspicuous absence at the annual event. Iranian Foreign Minister Mohammad Javad Zarif had been a regular presence at the annual forum that brings together top politicians, CEOs and bankers, and he often clashed with his Gulf Arab counterparts at competing sessions. But this year, he did not show. As a result, the platform was wide open for Saudi Arabia, the United Arab Emirates and Bahrain to criticize Iran. Iran, the leading Shiite Muslim power, and Sunni Muslim Saudi Arabia, a key U.S. ally, are rivals for influence in the Middle East, where they support opposing sides in Yemen, Syria, Iraq and Lebanon. "In the Middle East, we have two competing visions ... and the vision of darkness is sectarianism. It's trying to restore an empire that was destroyed thousands of years ago. 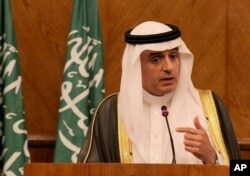 It's using sectarianism and terrorism in order to interfere in the affairs of other countries," Saudi Foreign Minister Adel al-Jubeir told a panel at the forum. "History has shown that light always prevails over darkness." FILE - Saudi Foreign Minister Adel al-Jubeir speaks during a press conference in Amman, Jordan July 9, 2015. Iran denies interference in Arab countries' affairs. Last year at Davos, Zarif said Iran and Saudi Arabia should be able to work together to help end conflicts in Syria and Yemen. Saudi-led forces, which back the Yemeni government, have fought the Iran-allied Houthis in Yemen's civil war. Saudi Arabia's crown prince has described Iran's supply of rockets to the Houthis as "direct military aggression" that could be an act of war. across the Middle East as agents of Iran. "Iran is a country that we need to deal with. ... As prime minister, I would like to have the best relationship with Iran, but I would like it state to state," Hariri said at a separate panel. "Iran represents a challenge in the region, maybe, but dialogue also is a part of resolving these issues," Hariri said. German Defense Minister Ursula von der Leyen, while acknowledging that Berlin had issues with Iran, used the moment to defend the 2015 Iran nuclear deal sealed with world powers, which U.S. President Donald Trump has threatened to abandon. "We have many worries about Iran, without any question, and we see a lot of problems with Iran, without any question. But we think that the Iran [nuclear] deal encapsulates the core problem, and therefore we think we should stick to the deal as long as Iran sticks to the deal, too," she said.